BOB ABERNETHY, host: A new report this week from the former heads of the 9/11 Commission says US authorities have not done enough to address the threat of homegrown terrorism. It urged new systems be put in place to counter radicalization. Kim Lawton reports that several leading US Muslim groups are already trying to confront those concerns with new efforts to prevent extremism from taking hold in their communities. KIM LAWTON, correspondent: It’s late afternoon in Manassas, Virginia, not far outside Washington, DC, and at the Dar al Noor mosque they’re getting ready for a good all-American barbecue. The picnic is part of a new national initiative from the Muslim American Society called the Straight Path Campaign. It’s one of several new projects being launched by US Islamic groups in an effort to fight extremism within their community, particularly among young people. IMAM MAHDI BRAY, Muslim American Society Freedom Foundation: We want them to say to America and prove to America through their efforts that, you know, we’re not terrorist suspects. We are America’s brightest prospects. LAWTON: According to a new poll by the Pew Research Center, Americans hold conflicted views about whether Islam is more likely to encourage violence than other religions. Forty-two percent of those surveyed said that Islam does not encourage violence more than others, but 35 percent said it does. Almost a quarter said they didn’t know. The survey also found that almost 40 percent of Americans said they had an unfavorable view toward Islam. That’s a significant increase from just five years ago. Since the terrorist attacks on Sept. 11, 2001, many American Muslims say it’s become increasingly difficult to counter the perception that their faith is linked to violence, and that job has been complicated by some recent high-profile terrorism-related arrests of Muslim Americans, including several who were born or raised in the US. EDINA LEKOVIC, Muslim Public Affairs Council: The fact that there has been a string of incidents presents a reality that we cannot afford to ignore, regardless of whether it’s emanating from our own homes, or our own mosques, or our own communities. BRAY: One is one too many, and so we have zero tolerance for that kind of seductive narrative and that seductive type of presentation that lures young people into things that will ultimately ruin their lives. LAWTON: One of the first priorities for mainstream US Muslim groups has been trying to fight extremist messages online, including many from foreign-based English-speaking Americans. 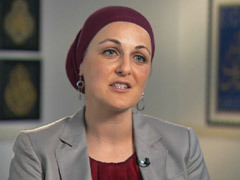 SALAM AL-MARAYATI, Muslim Public Affairs Council: What happens in extremist groups is that really there’s a cult mentality. There’s blind following of a charismatic leader, these pied pipers that are speaking to us now on YouTube from caves and jungles and war zones that are trying to glamorize violence. That’s basically what we’re dealing with. 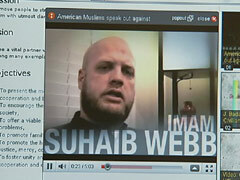 LAWTON: Hoping to offer a different view, American imam Suhaib Webb has set up his own Web site where he challenges radical statements and answers questions about Islamic teachings. IMAM SUHAIB WEBB: You know the Prophet, peace be upon him, said “If the day of judgment starts and you have a seed in your hand, plant that seed.” Stay positive. Never allow yourself to succumb to that negative discourse. LAWTON: He’s been urging other Muslims to tackle the issue of extremism head on as well. WEBB: If you’re not going to take the position, someone else will take that position for you. If you’re not going to step up to the mic, someone else is going to grab it and spit. That’s just the reality. LAWTON: Webb says a major problem is that many of the radical Web sites twist and misrepresent Islamic teachings, either intentionally or through ignorance. 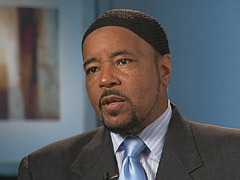 He was one of nine US scholars and imams who denounced extremism in a recent video produced by the Muslim Public Affairs Council. LEKOVIC: Communities really need to focus on religious literacy so that our young people start at an early age knowing what the Quran actually says, and what the Quran actually promotes us to do, which is to be a part of society, to be contributing, and to be good to our families, and to be model citizens within whatever countries we live in. LAWTON: With the Straight Path Campaign, the Muslim American Society is also trying to educate Muslim young people about the tenets of their faith. Imam Mahdi Bray draws from his own experience in the US civil rights movement and talks about the importance of nonviolence within Islam as well. BRAY (speaking at mosque): Nonviolence, the sanctity of life, is valued, and it’s not the sanctity of Muslim life. It’s the sanctity of all life. LAWTON: The campaign is holding a series of meetings with youth and youth leaders across the country to discuss violence and Islam, and also how to address injustice and discrimination in positive ways. Bray says it’s important not to dismiss the very real concerns and frustrations among young Muslims. BRAY: Providing young people with skill sets and tools that embrace nonviolence but at the same time doesn’t give them the feeling that they’re just rolling over and that they’re not really fighting back against some of the injustices that they see every day in their lives both here and abroad. AL-MARAYATI (speaking in meeting): We don’t separate Islam from politics. This is actually an act of worship for us. LAWTON: The Muslim Public Affairs Council is trying to help young Muslims address their concerns through the political process. 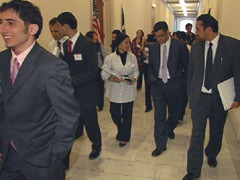 The group holds a Young Leaders Summit in Washington, where participants learn how government works. AL-MARAYATI: It’s easy for somebody to exploit people’s angers and frustrations and lead them to destructive behavior, so our approach is promoting the theology of life within Islam—that Islam is meant to be a part of a pluralistic society. LAWTON: The students see the mechanics of politics up close and get to meet with politicians, this year including Minnesota Representative Keith Ellison and Indiana Representative Andre Carson, the only two Muslims in Congress. Organizers say the experience gives young Muslims a new vision for what can be accomplished. LEKOVIC: In a post-9/11 reality, they sometimes have a hard time believing that their own government and their own elected officials want to hear from them, or even care about their opinions, because what they see on their campuses and in their hometowns is a rising level of Islamophobia. LAWTON: The various projects are intended to be proactive against radicalism, but they have also provoked controversy. Several outsiders have accused the campaigns and their leaders of not being tough enough against extremism, while some Muslims fear the new initiatives could give the impression that the problem is bigger than it really is. IBRAHIM HOOPER, Council on American-Islamic Relations: Some of the young people said, “Ah, yeah, before you get going on that, make sure it doesn’t portray us all as so-called radicalized,” that that’s a danger as well—to project something that isn’t there. LAWTON: Some Muslims have accused Bray of perpetuating anti-Islamic stereotypes. BRAY: There are some who say, oh, there’s no problem, everything is just fine, you know? Well, everything is not just fine. LAWTON: American Muslim leaders say their young people, like young people of all faiths, are trying to figure out their identities, and, the leaders say, religion should be a culturally relevant part of the mix. AL-MARAYATI: Islam is a religion that has a book that is supposed to be universal and is supposed to apply at different times. Therefore it is our responsibility to interpret the principles from the Quran and the traditions of the Prophet to America in the 21st century, and by and large that has not been done. LAWTON: It’s a matter that hits all too close to home for students like these. ATTIQAH SYEDA: The words “Muslim” and “terrorist” are not synonymous in any way, shape, or form. LAWTON: And that’s the ultimate message they hope takes hold. Duke University: "Anti-Terror Lessons of Muslim Americans"